My first introduction to Oktoberfest was in a movie. Remember National Lampoon’s European Vacation? I remember watching it on Super Channel when I was a kid. It wasn’t the most kid-appropriate film, but I loved it. There was a scene in the movie when the Griswold’s are at Oktoberfest in Germany. It’s pretty funny! Another little tidbit – I studied German in high school from grade 11 through OAC (grade 13 in Ontario back then). In fact, I won the German award at my high school graduation. Today, if you were to ask me to speak German, I’d be only able to do the basics. My French is much, much better though! With Oktoberfest coming up, I wanted to honour my German heritage (my grandma on my dad’s side is German) by making some Oktoberfest recipes! Maybe I’ll even spring for some German beer too…we’ll see. Some of the recipes are hard to understand so I included what it is in English. I attempted to pronounce them too and am sure I failed miserably. Herr Grubb would not be proud – eek! If you can’t make it to Oktoberfest in Munich this year or even down to Kitchener-Waterloo (if you’re in Ontario), why not have your own Oktoberfest celebration? I think it would be fun to have a few friends over and sample some new cuisine! You might also like this Sauerkraut Salad. Which Oktoberfest recipe do you want to try? 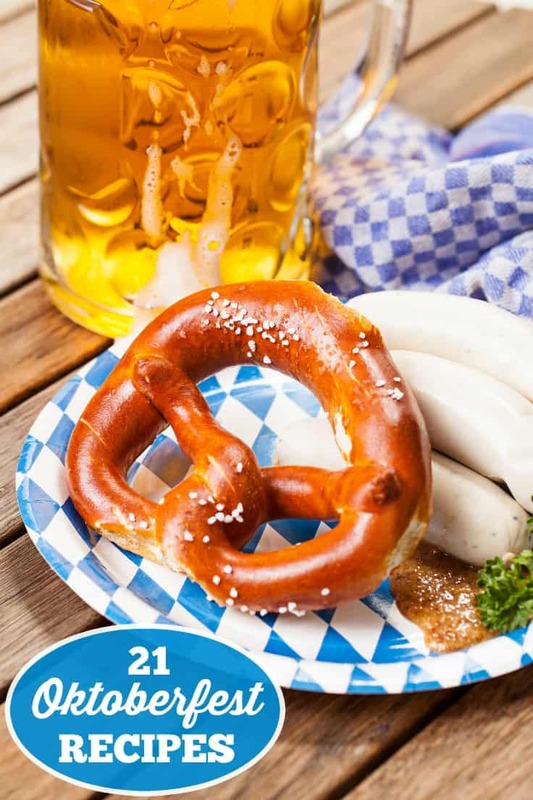 I want to try some of these Octoberfest recipes! There are so many that looks delicious and I am German and my Dad loves it when I cook him German food. Thanks for sharing. What a fun time of year–and Oktoberfest! We lived in Kitchener for a few years, and boy, talk about great food! My favourite is Weiner Schnitzel, but I’ve never been able to master cooking it myself. How cool! We’re doing an Octoberfest dinner with friends at the end of October. Only in my case there will definitely be German Beer! All of the recipes look so good, but I think I’d try Hot German Potato Salad first! Mmmmm….. I love any food associated with Germany, Octoberfest, so good may be fattening but who cares the taste is awesome, I love brats and sauerkraut and I have even made my own sauerkraut and it turned out awesome!! I remember Lampoon’s movie. That was a classic. Love Octoberfest foods, especially Schnitzel. The first recipe I would like to try is the German Pretzels. Thanks for sharing some of your heritage and these wonderful recipes! I’m not German but I did live in Germany for about 30 yrs or so, so I know Oktoberfest quite well. One of my daughters lives in Bavaria, which is where the best Oktoberfest celebrations take place, so I’m told – not my thing since I don’t like alcohol, the noise nor brass bands.